Venus and the bright star Regulus will shine bright near each other about one hour before sunrise on Saturday, Sept. 6. Early-bird stargazers with clear weather on Saturday (Sept. 6) will be treated to a striking celestial sight, as the most brilliant planet in the night sky will appear to shine near one of the brightest stars in the sky. The planet is Venus and the star is Regulus in the constellation of Leo, the Lion. Venus is currently visible as a brilliant object in the pre-dawn sky, shining at a magnitude -3.9 on the scale used by astronomers to measure the brightness of sky objects. But the planet is steadily getting lower in the morning twilight with each passing day. It currently rises just over an hour before the sun. On Saturday morning, binoculars and telescopes can show the 1st-magnitude star Regulus as Venus passes near it. About a half hour before sunrise, the planet and star stand about 7 degrees high above the horizon, slightly north of due east. The apparent width of the moon in the sky, as seen from Earth, is about one-half a degree. 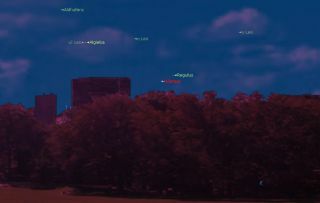 North American observers will see Regulus about 1.1 degrees to the right of Venus on Saturday morning. When September began, Venus glowed just to the west (right) of the famous backwards question-mark pattern of stars known as the "Sickle of Leo" and was poised above and to the right of Leo's lucida — its brightest star — Regulus. But because Venus was moving at roughly a degree per day toward the east, the space between the planet and star appeared to rapidly close with each passing morning. Converting this into a ratio, we find that Regulus — one of the 21 brightest stars in the sky — shines only 1/120th as bright as Venus! By the end of this month, Regulus will have moved higher up in the east-northeast sky and will be rising about three hours before sunrise. Venus on the other hand will be rising only about a half hour before the sun and will be very difficult if not impossible to see because of its proximity to the sun. Editor's note: If you capture a great photo of Venus and Regulus, or any other celestial view, and you'd like to share it with Space.com for a story or gallery, send images and comments to managing editor Tariq Malik at: spacephotos@space.com.